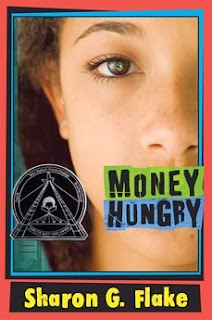 Thirteen-year-old Raspberry Hill is starved for money. She will do just about anything legal to get her hands on the almighty dollar. Memories of being homeless, sleeping in the streets, and eating from handouts keep Raspberry's eye on the only prize that matters to her: cold, hard cash. This unforgettable novel will keep you glued to each and every page. Bank on it. This story takes you into a different place and opens your eyes to another life. It wasn’t a fast-paced story, but I had enough questions in my mind that I wanted to see how it ended. Raspberry is a strong character and I enjoyed her determined attitude and wish to make things better for herself and her mom, as well as her loyalty to her friends. I read this one as an e-book from my local library. As a writer, I’d study this more to see how to create an interesting opening – it puts a question in the reader’s mind right away. I’d also pay attention to the way the author used small details that Raspberry would notice to help develop her character. Sharon Flake went to college to become a pediatrician, but ended up majoring in writing instead. For more info, visit Sharon Flake’s website. "Assume every editor is looking for a reason to say no. Don't give it to them." Monica Trasandes, 6 Keys to Revising Your Fiction, Chuck Sambuchino's Guide to Literary Agents Blog. I've heard this before in different ways from different sources. Right now, I'm immersed in a tough revision. This reminds me to work a little bit harder, to not be satisfied until I've written the best story I can write. I love the other tips in this article too, especially the one about not getting stuck at the beginning. Sneaking back to my writing now, determined to move on from the place I've been stuck at for several days (it's not the beginning, but it's been holding me up). 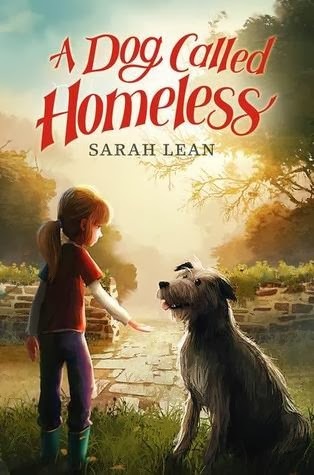 I know this is a picture book, and not technically targeted for readers of middle grade books. But since International Dot Day was on September 15th and this is a book that can be enjoyed by readers of all ages, I decided to feature it today. If you're a regular follower of my blog, you know I did this last year too, but this book is one that stands up to re-reading! Plus, it’s one of my favourites! I think anyone, no matter what their age, can relate to the feeling of not feeling good enough to even try. I know I’ve felt that way as a kid (I was terrible at sports) and sometimes still as a writer (there are days when I want to give up). This book has many important ideas about taking a chance, practicing, persevering and feeling proud of your accomplishments. 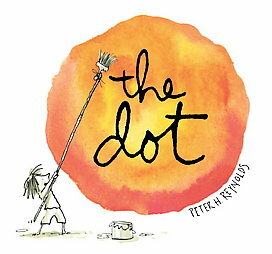 I love the idea that something simple like a dot could change someone’s perspective. It’s worthwhile to think about how a bit of encouragement plus some time for thinking and experimenting can lead to something amazing. I also love the illustrations in this book, the simple lines and beautiful colours seem just right to convey the story’s message. This book has special meaning to me. As a volunteer at my daughter’s school, I attended an assembly where the principal read this book to the entire school. The principal passed away a year or two later, but when I read the book, I think of him and how caring and fair he was to the students. Peter Reynolds is the illustrator of the Judy Moody series of books. He is also the co-owner of a bookstore, The Blue Bunny, in Dedham, Massachusetts. He has a twin brother named Paul. The Dot has won many awards, including the Chapman Award for Best Classroom Read-Aloud, Irma S. and James H. Black Honor from the Bank Street College of Education, The Christopher Award, and was named an Oppenheim Toy Portfolio Platinum Award Winner. It is also an animated film by Scholastic/Weston and FableVision. For more, visit Peter Reynold’s website or The Dot website. This week, the finalists for the 2013 Canadian Children's Book Centre Awards were announced! These prestigious Canadian book awards are presented in October. Congratulations to all the nominated authors and illustrators! This year, there will also be a chance for kids to vote for their favourite from a selection of shortlisted titles for the TD Canadian Children's Literature Fan Choice Award. Actually, all the rest of them look good too. I guess it's off to the library for me this weekend! If you have any other recommendations for me, I'm always on the lookout for good middle grade and YA books to read! Ten-year-old Michiko wants to be proud of her Japanese heritage but can't be. After the bombing of Pearl Harbor, her family's possessions are confiscated and they are forced into deprivation in a small, insular community. The men are sent to work on the railway, so the women and children are left to make the trip on their own. Then the government announces that they must move once again. But they can't think of relocating with a new baby coming, even with the offer of free passage to Japan. Michiko pretends to be her mother and writes to get a job for her father on a farm in Ontario. When he is accepted, they again pack their belongings and head to a new life in Ontario. It was interesting to learn about the life of Japanese-Canadians during the Second World War, especially through Michiko’s eyes. This is a quiet novel but I liked the sense of family and the details about life in a different time and place. 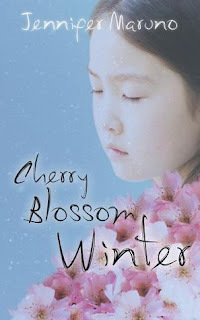 This book is the second in a series of three about Michiko’s life. After finding this second book at the library, now I'd like to read the first one! I admired the writing style, especially the way the author wove in memories to develop the characters and background for the story. Details are carefully chosen to enhance and not overwhelm the writing. Jennifer Maruno started writing in grade 3, creating stories for a make believe Daily Planet newspaper and entering writing contests. She won a tour of a pickle factory and a year supply of pickles! She lives near Toronto and used to be a school principal. As a teacher and principal, she created curriculum materials for teaching math using literature. Now she writes full time. The idea for her story came from the memories and photographs of her mother-in-law. On her website, Jennifer Maruno has some wonderful advice for writers: “you have to learn the craft - not a formula”. She also suggests “you have to hang out with writers - they are the only ones in the world that really understand what you do”. For more info, visit Jennifer Maruno’swebsite. It was a great place to connect with other picture book writers. I ended up making changes to strengthen two query letters, as well as changing the beginning of a manuscript to improve the opening, based on feedback from other writers. So I felt like it was a worthwhile experience, considering I didn't have to go anywhere to attend. The key to having a good experience with this online conference was to plan on learning as much as possible and to make an effort to connect with other writers. I appreciated the chance to really think about why some stories worked and made me laugh, and why others seemed flat and in need of more work. What resources have you explored lately that are helping to improve your picture book writing?